Dynamics 365 for Marketing comes with a wide variety of professionally designed templates. Most templates include a column layout, color scheme, sample content, and sample images, whereas others provide just a basic column layout without sample content. There is also a blank template, which provides no sample content or structure. The first thing you do each time you create a new message, page, or form is to choose a template. 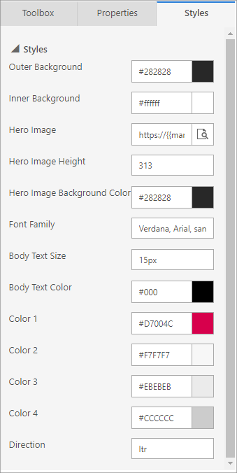 You can easily work with the supplied content and styles using the designer, but the column layout is semi-permanently established by the template you choose (you can only change it using the HTML code editor). When you create a new design, the selected template's content is copied into it. The design and template aren't linked, so when you edit the design, the template won't change; likewise, any future changes that you make to a template won't affect any existing designs that were created using it. You can easily create custom templates to match your organization's communication needs and visual identity. You can save any existing message, page, or form as a template, or work directly in the relevant templates area to create them. You'd typically start with a design based on an existing template, customize the design as needed, and then save the result as a new template. When setting up a template, you can add various types of metadata (such as purpose, style, market type, and optimized for) which make each template easier to identify and easier to find by using filters in the Select a template dialog box shown to users each time they create a new email, page, or form design. The default templates are maintained as part of the solution and might be overwritten when Dynamics 365 for Marketing is updated. Therefore, if you want to customize a default template then you should always save the result using a new name rather than saving it under its default name otherwise your customizations could be overwritten during the next update. 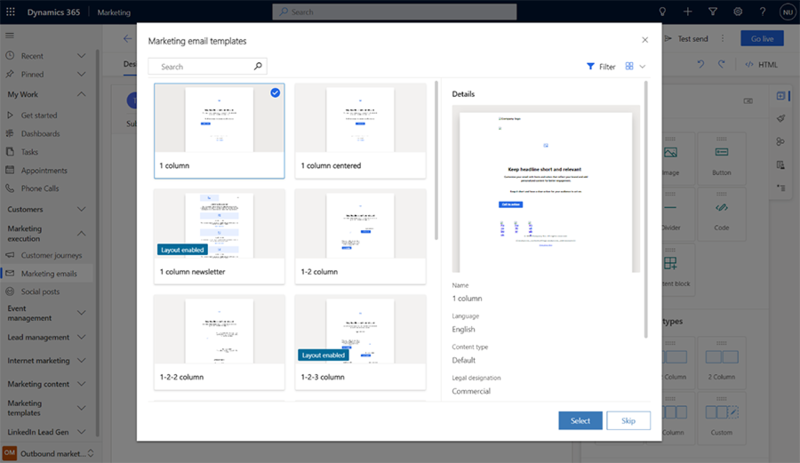 All email and page templates included with Dynamics 365 for Marketing provide style controls to help you quickly adapt them to the colors used by your organization or campaign. The style settings vary according to which template you choose. Designs based on a blank template don't provide styling controls unless you (or your system customizer) have programmed them to do so by using the right HTML markup. Hero image settings: The hero image, when present, is usually the largest image on the page, generally located at or near the top of the message. These settings control the source URL of the image and the style settings that affect it. Use the browse button for the Hero image setting to choose an image from your Dynamics 365 image library. Font and body text settings: These set typographical options that apply to most of the text in your message, but usually not headings. Direction: Depending on which language you're using, you'll choose either LTR (left-to-right) or RTL (right-to-left). The settings provided for each template are set up using custom attributes in the template's HTML. You can edit and create these as needed when customizing or creating your own templates. More information: Use custom attributes to enable designer features in emails, pages, and forms. All email templates included with Dynamics 365 for Marketing have been tested against a wide range of available email clients, as listed in the following tables. The templates should work flawlessly on most modern clients, but some design elements might degrade on older, less-used clients. Gmail has a size limit of 104 KB, so markup that exceeds this limit will be cut off. All out-of-the-box templates are smaller than this, so they shouldn't be affected unless they've been heavily customized. Borders around buttons are not supported. Rounded corners might not be rendered correctly. Background images aren't supported when they have text or button overlays. T-Online email clients will render two buttons, regular Button and VML markup. The Android 4.4 email client shows only about 60 percent of the template width. We haven't been able to verify whether horizontal scrolling is possible. As far as we know, this only affects the native Android client, not the native clients included with phones from most manufacturers, such as Samsung. SFR.fr email clients display a background color for some links. Lotus Notes email clients have general rendering issues with the templates. Dynamics 365 provides both a simulated preview and an inbox preview for email messages. Inbox previews are more accurate because they're rendered for specific email clients. Inbox previews are provided by a Microsoft partner called Litmus Software, Inc. Litmus previews are created by rending your message on actual email clients and then returning a screenshot of the result to you. The following known issues can occur with inbox previews. Missing footer : Litmus screenshots sometimes fail to capture the entire message height. Unable to scroll : The returned preview is a static screenshot, which might include scrollbars for messages that are higher than the screen. You can't actually scroll the image using these. The message is too high : Sometimes Litmus renders extra content at the end of the email message. Only half of the message is visible in the preview : This can happen if Litmus takes a screenshot before the message is fully loaded. Try to reload the preview. If problems persist, then the message may include dynamic content that isn't resolved.